“SU-76 Gai” or “SU-76 Cast Superstructure” are unofficial names for a mysterious Chinese PLA (People’s Liberation Army) SU-76M conversion. According to photos, it appears to be an SU-76M with a new superstructure, similar to a Type 59’s or Type 62’s turret. There is only one dubious looking photo of the tank, leading to speculation as to what the tank is, or whether it is even real. The most convincing theory about this vehicle is that it is merely a crew or infantry training vehicle – various convincing mockups are known to have been made for just such a purpose. However, other theories about the vehicle do exist. The USSR supplied the PRC (People’s Republic of China) with 704 SU-76Ms between 1951 and 1954 as part of the 3000+ vehicles supplied from 1950 to 1955. These SU-76Ms were, according to data supplied by Dr. Martin Andrew, split among 30 regiments. 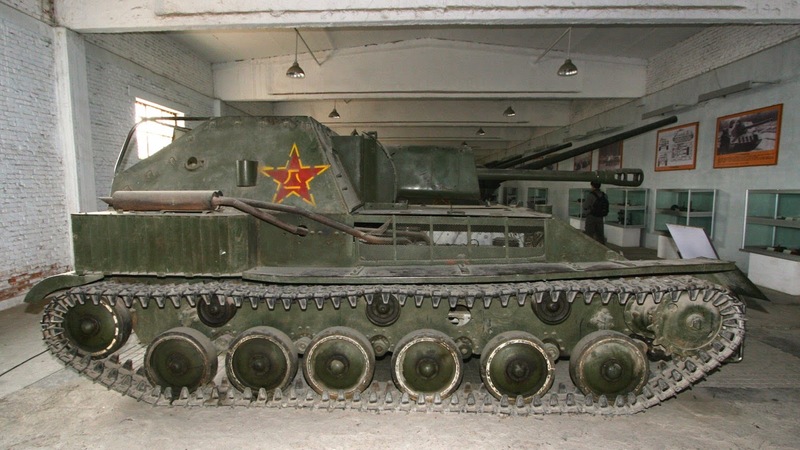 Some SU-76Ms were fielded in Korea by the CPV (Chinese People’s Volunteer Army – effectively a branch of the PLA), who had 9 regiments including 278 T-34-85s, 38 IS-2s, 27 ISU-122s. By 1959, SU-76Ms were still in service with the PLA, owing largely to the relatively small number of tanks available to them. At this time, an army infantry group was typically comprised of 42 units – 11 of which were infantry battalions, the other 31 being different unit types. On average, the 31 other units fielded 271 artillery pieces (which includes mortars of 60mm or more in caliber), 114 aircraft, and a meager 22 AFVs – usually SU-76Ms or Type 58s (lightly upgraded T-34-85s). By 1980, armored regiments usually comprised of 1 battalion of 31 Type 59 Main Battle Tanks (MBTs), a recon platoon of 3 vehicles, and a company of 10 assault guns (usually SU-76Ms, but elite front line divisions had SU-100s, ISU-122s, and ISU-152s, which were now in smaller numbers). As the PRC developed its own assault guns by the late 1970s / early 1980s, it seems as though the SU-76M (and other Soviet-supplied tanks) were phased out. The source of the image of the “SU-76 Gai”, suggests that there is no information on the vehicle, and this has led to a lot of speculation on what the vehicle is. The modification, if it actually existed as a real tank (see below), probably dates nowhere outside of the early 1950s to the late 1960s, as the uniforms of the soldiers are fairly generic for that period. Essentially, the photograph shows a SU-76M with a new superstructure that resembles a Type 59 or Type 62 turret. The superstructure is not simply a Type 62 or Type 59 turret because it is too small to be either, and it also has a different type of cupola (which is just in shot). There are three other details of some interest. Firstly, the tank has new fenders, probably locally made. Secondly, the vehicle has a slack track, probably indicating at least one missing roadwheel or idler. Thirdly, the gun is a 76mm ZiS-3, which unlike the SU-76M, does not have a protective casing, perhaps indicating that it was a field gun, and not taken off a SU-76M. The tank itself may not even be a real tank as such. It could be a crew or infantry training tank, although made from quite substantial military hardware. This actually appears to be the most convincing theory. 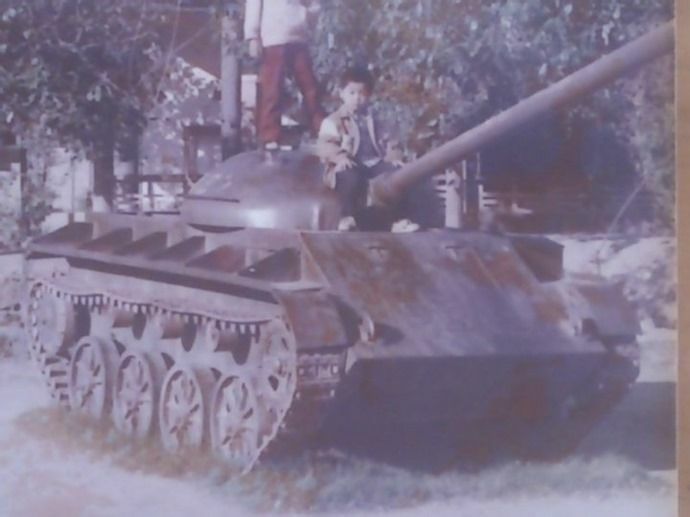 The Chinese made various training tanks that resembled Soviet T-62 tanks using various parts of military hardware. Available photos show that these tanks were mostly made from scrap, but some parts such as wheels and tracks, appear to be taken from real tanks. It does, however, seem somewhat odd for the vehicle to have hardware such as a real gun, as other mockups did not have these. The vehicle could have been made for propaganda photos, hence why it was made from more substantial military hardware than other infantry training tanks. Firstly, the new gun mount seems as though it might give a higher firing arc for the gun compared to the original SU-76M mount. Secondly, the new superstructure, if enclosed, may also be preferable to the crew during poor weather, and increase crew protection in combat from the danger or shrapnel and small arms fire – one of the many complaints of Soviet SU-76 crews. Dr. Martin Andrew has suggested that the tank might be a test bed in order to see if the Type 59 turret can be scaled down, with the suggestion that it was part of the development of the Type 62 (itself essentially a scaled down Type 59). *There is some supposed evidence to indicate that the Chinese attempted to build their own SU-76s, but this hinges on one museum photo, the caption of which, once translated (as many sources neglect to do this), suggests it to be a crew training vehicle. If this theory is correct, then it places the date of conversion closer to the late 1950s or early 1960s. There are some issues with the image of the “SU-76 Gai” which may indicate that the entire image has been faked. Upon close inspection, the man on the left’s shoulder and arm appear translucent. The gun barrel, too, appears to have a similar problem. The source material for the photo does not comment on this. It is possible that the man and gun moved during the photo, or there was some kind of exposure problem with the film during development which has caused this illusion. Further analysis is difficult, as the image is printed on poor quality paper. It seems unlikely that the photo is a modern fake. The superstructure is not a simple copy and paste of a Type 59 or Type 62 turret. Thus, the creator would have had to draw a new superstructure and edit it into the image. With the amount of effort that this would take, it seems strange that the creator might neglect to check for any transparency between their editing layers, which would lead to a man and gun barrel appearing translucent. There is only speculation to be made on the “SU-76 Gai” without further photographs or further literary sources. This is compounded by fairly inexplicable indications that the image might have been faked. Whilst it is the author’s opinion that the vehicle is most likely a training vehicle, in any case, the vehicle’s true history is likely to never be known. The only known photo of the “SU-76 Gai”. 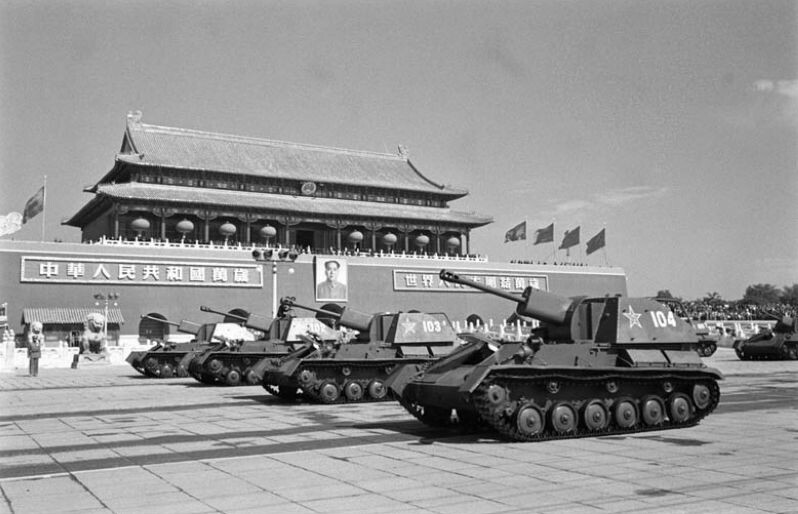 SU-76s on parade at the Forbidden Palace, Beijing, probably 1954. 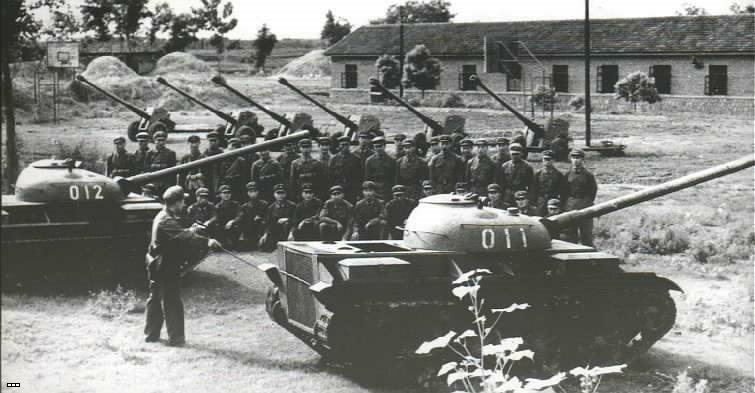 Chinese infantry training tanks made to resemble T-62s. Without the knowledge that these are training tanks, it may be tempting to speculate that these are some strange prototype tanks. Another training vehicle, likely on display for the public. Discussion with Dr. Martin Andrew regarding Chinese SU-76s and tank prototypes. “The Tank Division of the Chinese People’s Liberation Army 1945-1949“, by Zhang Zhiwei. I don’t know how this wasn’t spotted, but if you look at the track behind the guy on the right, you can see where it is drooping or sagging very badly. My guess is that this is a regular SU-76 which was destroyed in some fashion, possibly used as a target or perhaps it rolled over. The fairing that would normally be there was knocked off. Perhaps the two guys posing in the picture because they were ordered to salvage to junk. Who knows, but it is clear this is no operational mystery tank. Forgive me. I must have read too quickly. The track is mentioned! However, I still think this is simply some broken piece of kit that was sent back to the motorpool for repairs. The turret is slightly different I suppose, but all other pictures of this series show shrouds over the recoil mechanisms where this one’s is missing. The turret looks a lot like the one in the museum (though we can’t see the left side of the vehicle) and not the ones on parade which to me, are completely different. The SU-76Ms on parade, and the SU-76M in the museum are the same vehicles. The superstructure of the SU-76 Gai is entirely different. If you look at more photos of any other SU-76M (I only included a couple of Chinese SU-76M photos, but there are plenty of Soviet photos of SU-76Ms), you will see this. I guess. I really had to zoom in to see them properly. I still think that that busted idler wheel is key. While it may have been some kind of ‘Frankentank’, if it was any kind of new weapon, there would have to be better pictures than some one-off with a broken track assy. With regards to there being more pictures, or better pictures, this isn’t really something I can agree with. PRC tanks are actually rather secretive, and interest in them has only really came about in the last few years because of video games such as World of Tanks. In fact, we’ve seen very few photos of Chinese prototype tanks until very recently, and even fewer of modifications such as LVT(A)-4 and LVT-4s with 57mm ZiS-2s and 76mm ZiS-3s. So, if we were to assume that this is a prototype tank, I still think it’s not suspicious that there’s only this image available to us. It’s a good point, though, seeing as though there are a handful of photos of most other prototypes, and certainly something to bare in mind. From hereon, let’s ignore the fact that the image might be fake (with the gun and left soldier transparency issues) for the sake of argument. The broken track really might be the key, as you suggest. If it is some kind of prototype, then it might have just fallen into disrepair and the idler was never replaced. I don’t think that’s too unreasonable. So, that’s one theory. However, you make a good point, and point #2 in the article hits on this – as I say, it could be a tank assembled from junk parts to make a neat little propaganda piece for photos. Propaganda photos (in fact, many private photos) with military hardware are very very common (I own a few dozen myself and collect Chinese photos). But as I note, the new superstructure is not just a Type 62 or Type 63 turret – it’s either a newly made superstructure, a heavily modified Type 62 turret (again, I haven’t checked dimensions as of yet to see if this is plausible, so bare with me on this – it has to be heavily modified because of the gun sight, the new cupola, etc), or it could be an unknown prototype tank’s turret (which might explain the gun sight, the new cupola, etc). Whether it’s a new superstructure that is made from a heavily modified Type 62 turret, some other light tank prototype’s turret etc, I cannot be sure. The cupola is the biggest issue because it’s so different to Chinese cupolas, even on known prototypes, so we’ve got a real problem there. This is really important, because if it were just a Type 62 tank’s turret plonked onto a damaged SU-76 chassis, with maybe a few mods to make it look half decent (EG new fenders), then i’d be very tempted to call it a propaganda piece mock-up with a little more certainty (again, ignoring the issues with the image possibly being faked). In any case, as I conclude, we can only speculate, and even then, this hinges on whether you believe the image to be real. Why can’t we see bigger pictures of the tanks anymore? When all HD pics would be watermarked they will be back again. I personally never knew this tank was ever a thing, nor have I seen that picture. But it was very interesting to read about. Very plausible, and actually worth adding in as a note. Have you got any photos showing more realistic training tanks such as the photo we see here? Ah, very good. I’ll add some of these into the article. I appreciate the photos. In fact, i’ll go a step further. I think this is the most convincing theory.